All the thrills and skills of BBC TV's action-mad spectacular. A 6-event contest for all the family. 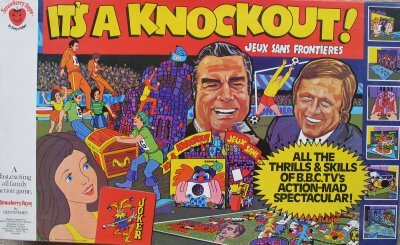 It's a Knockout was published by Denys Fisher, under their Strawberry Fayre label, in 1974. Each player throws the scoring dice. The player with the highest score picks the coloured runner of his choice and starts the Marathon Race. Each player then receives one Joker card, a blowtube and a large tiddlywink of his colour. Players move around the board, playing games when they land on a Games square. Points are awarded for your position at the end of each individual game. The game is over when all the players have passed the winning post of the Marathon Race. The winner is the one with the highest score.